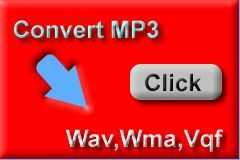 Convert MP3 to WMA, VQF, WAV and other audio formats. Download a FREE version now! converts MP3 files into CD compatible WAV files! converts MP3 files into Microsoft Media Audio WMA files! converts MP3 files into NTT Cyber Space Lab's Audio VQF file! Copyright © 2001 MP3 to All Converter team. All rights reserved.